I'm not sure my attempt at humour was appreciated. A few weeks ago, I was at the Salon De Parfums on the top floor of Harrods, being talked through the wares of the relatively new Ex Nihilo brand. And of course, as any of you who know its Unique Selling Point will guess, I was shown the workings of a large, highly-polished, cylindrical device they call the Osmologue. Essentially, the gizmo allows buyers to create semi-bespoke versions of the brand's scents by adding an extra ingredient from a pre-selected set. The process involves placing the fragrance inside the Osmologue, pressing a couple of buttons and watching whilst a few liquids are squirted into the bottle. As I stood gazing upon this piece of olfactory theatre, I was struck by the thought that the whole thing was rather like buying mix-your-own-colour Dulux paint at B&Q. So I decided to share this profound insight with my hosts. But I don't think they were impressed. Maybe they remained stony-faced because some of them were thinking the same thing I was thinking: that the business with the Osmologue seems a tiny bit desperate. Mind you, I don't blame Ex Nihilo for trying to be innovative. Goodness knows any brand setting up today needs to think of ways to stand out from the competition. But I wonder if seemingly high-concept, glossy strategies like the Osmologue are the way to go. Doesn't their novelty wear off rather quickly? And is semi-bespoke as powerful a draw as some would have us believe? Then again, the Salon De Parfums is a world unto itself - a rarefied enclosure where the normal laws of shopping physics don't apply - so if the Osmologue is going to be a success anywhere, this is probably the place. But how does the brand measure up on more earth-bound territory, away from a setting in which £300 for a single bottle of scent is considered to be something of a bargain? Well, the founders of Ex Nihilo - you can find their bios on their site - certainly didn't pull any punches when deciding who to commission to make their fragrances: they went straight to Givaudan, one of the world's premier perfume manufacturing companies. 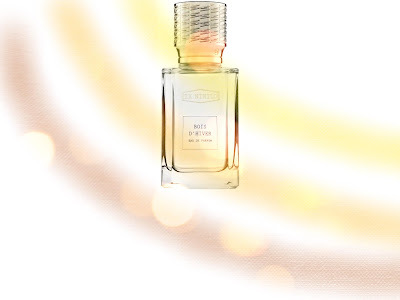 However, Givaudan's stature notwithstanding, should Ex Nihilo's choice be seen as bold or as further evidence of an unfortunate condition which has been crippling the independent perfume sector for quite some time? In recent years, far too many non-mainstream brands have tried to appropriate the outer trappings of what we used to associate with 'niche' - the exclusivity, the artisanal air, the kudos - whilst producing scents which are only marginally more interesting than most of the creations available on pretty much every high street. In other words, they want the best of both worlds: the 'quality' tag of niche as well as the high-volume commercial appeal of the mainstream. I'd assert that Ex Nihilo is one such brand. There is essentially nothing wrong with most of their perfumes. After all, a certain, basic standard of competence and technical accomplishment are precisely what you'd expect when you hire the wizards at Givaudan. But in perfumery, "nothing wrong" is almost on a par with "redundant". Well-made though they most certainly are, none of the creations in the range is what I'd call exciting, uncompromising or vital. Take Guillaume Flavigny's Vetiver Moloko for instance. It is a solid, everything-in-the-right-place vetivert, but for this very reason, it's rather predictable, and therefore, fairly dull. In order to tie in with the eponymous 'moloko', the sandalwood in the base - shades of Chanel's Sycomore - adds a creamy texture, but it isn't sufficient to make the whole memorable. Olivier Pescheux's Rose Hubris opens well - there's more than a hint of Edouard Flechier's Une Rose (Frederic Malle) in its crimson, woody-green opening - but it too fails to sustain the wearer's interest for a significant length of time. And so it goes on. Oud Vendôme, also by Pescheux, claims to be a chic, French take on agarwood, but I'd say that in its attempt to straddle both western and Arabian territories, it ends up stumbling and landing nowhere. Aurélien Guichard's Jasmin Fauve initially places an unusual facet of burnt matches next to its floral note, but it ends up turning into an insubstantial white floral. And Cologne 352, by Jacques Huclier, is far too muted and weighty to convince as a cologne. If I had to choose a few favourites, they would be Louise Turner's Musc Infini, Quentin Bisch's Fleur Narcotique and Michel Girard's Bois D'Hiver. The former is an attractive blend of sugary vanillic notes with translucent synthetic musks, but it owes far too much to Shalimar - via Malle's Musc Ravageur and Tom Ford's Noir - to be able to carve a distinct identity. Narcotique is a deceptive shape-shifter, presenting an indifferent bouquet of jasmine and orange blossom, before using musks and woods to turn the florals into something more compelling and, yes, as its name implies, perhaps even addictive. Finally, the latter is notable for lifting a sandalwood base (mostly synthetic-smelling, I regret to say) with a scattering of ginger, cardamom and pepper. It's an intriguing juxtaposition, displaying levels of inventiveness and humour which are conspicuous by their absence in the rest of the range. But oops, sorry: I mustn't mention humour. PS The Ex Nihilo range also includes Venenum Kiss by Quentin Bisch, which I have yet to try. PPS For those of you who are interested, here's how the semi-bespoke service works. Each scent's original composer was asked to think of three different ingredients which could be added - individually - to the composition without distorting the overall balance. These optional extras range from sandalwood to orange blossom, rose, vanilla and iris, amongst others. Testers of all the combinations and permutations are available so that clients can smell the end results. The semi-bespoke versions are then mixed up in store - using the Osmologue, of course - whilst the customer waits. It's because of reviews like this that we love you. While you have a nose comparable to say a certain candy loving fragancephile, you willingness to call a spade a spade, and your lack of association with any enterprise, means the readership can really trust your opinions. The vast majority of perfume releases are derivative and creatively destitute, and thus the vast majority of reviews on a genuine site should reflect this. Keep up the good work and thank you for 'keeping it real'. Do bare in mind that as your reputation and profile rises, this will come under pressure from lucrative offers. What would life be without humour? It's a great weapon against the hardships and the absurdities that one comes across during the day. I always appreciate humour and I find your comment funny. Especially when you are expected to be fascinated or overwhelmed by something that is average at best. What I got from your description is: The Osmologue is meant to fascinate the average perfume consumer, I suppose. Perfumistas and people who are familiar with aromatherapy and who have some idea about mixing of ingredients and layering could be impressed with the technical and visual part but not so much with the outcome. Often less is more. I am not familiar with Ex Nihilo so I cannot comment on the quality of their products but as usual - I trust your review and I will keep it for future reference. Neva, thanks for stopping by. Yes, as I intimated in my review, I found the Osmologue a questionable idea. Is semi-bespoke the way to go? Does the artistic merit of a perfume become diluted if the consumer can, quite literally, add a few drops of x, y, or z to the composition? Should a gleaming machine be a factor in persuading us to part with our cash? Something to ponder, eh? Time will tell...I wish them luck with this invention, but I doubt that I will fall for it. Yet I'm very curious about this top floor in Harrods and on my next trip to London some day I will be visiting it surely. Neva, the Salon De Parfums is a must see. Even the people who don't like it concede that it has to be visited at least once.